Bring together twenty passionate hospice providers to discuss challenges to palliative care program implementation, and the ideas start flying! CAPC did just that during the 2017 National Seminar in November, holding a lunchtime focus group with leaders from large and small, urban and rural hospice organizations from across the country. In a lively facilitated discussion, CAPC asked those in the room—physicians, administrators, social workers, nurses and educators—to share their perspectives. Regardless of the size or location of their hospice organization, clear trends emerged as participants discussed the hurdles hospices face when offering both community-based palliative care and hospice care under their hospice corporate umbrella. Here’s what we learned. Will a hospice’s palliative care services cannibalize its hospice program? Hospice leaders often struggle when deciding what to include in their community-based palliative care (CBPC) service package, fearing that palliative care patients who receive a high quality, robust bundle of CBPC services will resist moving to hospice care when appropriate. The result: patients enter the hospice program late, if at all. If hospice services are better reimbursed than palliative care, this scenario is a threat to the organization’s bottom line. When a palliative care program is comprehensive and meets National Consensus Project (NCP) guidelines, it can present a threat to its hospice—why would patients transition from palliative care to hospice care when they are receiving the same quality of care? As hospices expand their business lines to include a CBPC program, the organizational picture can become murky, both internally and externally. Trying to distinguish between an array of programs is confusing and complicated for referral sources, particularly when programs aren’t thoughtfully and properly branded and marketed. Relationships with partners and referrers often develop informally, over time. The result can be a blurred understanding of the CBPC program’s parameters—who it serves and what it offers—and how it differs from care available through the hospice’s Medicare benefit. Payers, new to CBPC and still learning its benefits for their enrollees, are vital stakeholders yet are often uncertain how a hospice’s diverse service lines fit together and which program is best suited to meet a given patient’s needs. 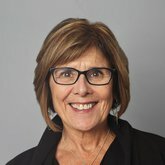 Hospice-run CBPC programs are as unique as the communities they serve, making it hard for leaders to understand and compare how their programs stack up with other CBPC programs. What is a standard caseload? Are there benchmarks for CBPC program operations? A national picture on program parameters is still TBD. CBPC program leaders have been “met with blank stares from administration” when stating their need to measure outcomes for quality reporting, especially when these measures are necessary to justify payments from payers or risk-bearing entities such as Accountable Care Organizations. Quality measures for palliative care are available, including clear measures that are important to financial stakeholders, but hospice organizations often lack in-house expertise for measurement. CBPC programs often don’t know what to measure, don’t have processes in place to efficiently measure, and struggle to fit hospital and hospice measures to their palliative care program. Hospices need interconnectivity across all programs serving a patient—palliative care, hospice care, and hospital services. EMRs are generally either hospital-friendly or hospice-friendly (but not both!) and present interoperability barriers to communication between programs or entities. Leaders note a lack of reliable financing strategies to support CBPC programs and the need for improved and standardized reimbursement. Value-based payment is forcing a move away from fee-for-service reimbursement and prompting the need for partnerships with payers and others willing and able to invest, yet many hospices are too small to attract the attention of payers and other risk-bearing entities. Contracting with payers and other risk-bearing entities requires the ability to deliver consistent and reliable services to all eligible patients. As demand rises, programs often struggle to staff up quickly to meet their contractual obligations. They may lack knowledge on how to care for larger volumes of patients without adding staff, such as stratifying the population, partnering with other organizations for coverage, or incorporating telehealth into operations. The shifting corporate landscape in health care makes it difficult to plan and assimilate palliative care programs in the face of mergers. Variability among palliative care programs is confusing for payers that are interested in potential partnerships with hospices in the value-based market. They wish for programs to be consistent and look the same—yet every program is different. Don’t launch a CBPC program without conducting a thorough Needs Assessment. 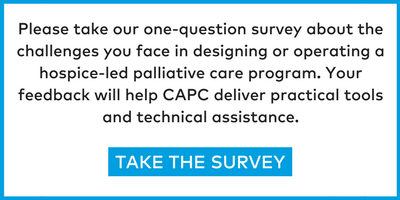 The assessment (available to CAPC members) provides answers to why the hospice should (or should not) develop this new business line, clarifies which patients are appropriate for the program, and points to the appropriate service package to meet their needs. It is the critical first step in differentiating the organization’s palliative care services from its hospice services. A major reason for failure to make timely referrals from a CBPC program to hospice is the close relationships that develop between the CBPC team and the patient and family, and a hesitancy to subject patients to yet another transition at such an emotionally vulnerable time. Consider a strategy of developing flexible teams who can continue to care for patients whether they are in the CBPC program or have transitioned to the MHB. Once the needs assessment is completed, talk through the details with stakeholders and potential financial partners, and design a feasible program together. Clearly define the parameters of the CBPC program. Using correct language and branding to help referrers understand distinctions among a hospice’s programs is key, particularly when offering multiple service lines. Defining clear patient eligibility criteria and conveying inclusion and exclusion criteria is essential, both within the hospice organization and to external stakeholders. Hospice-run palliative care programs have the advantage of being able to ensure a referral to hospice care when staff members recognize a patient’s eligibility and need. Even so, reliably transitioning patients to hospice at the right time requires solid protocols and staff training. When a hospice organization shares staff among programs, education for both hospice and palliative care staff is key. While the hospice benefit is strictly regulated (“black and white”), palliative care is by definition adapted to patient need in terms of duration, intensity, and type of service. Palliative care staff requires proper training and clinical guidance to deliver this care and to know when to appropriately transition patients. Hospice staff members, comfortable caring for patients who are predictably dying, are generally not well-trained to manage chronically ill patients who may live for a long time and who benefit from continued high-quality medical management. Hospices that operate CBPC programs should contribute to the National Palliative Care Registry™. Data received on program parameters and synthesized via the Registry will allow for national comparison of operational features over time. Don’t launch a community-based program without conducting a thorough needs assessment. It is the critical first step in differentiating the organization’s palliative care services from its hospice services.